Its an on/off relationship I have with beauty subscription boxes. In theory, I love the idea. Who doesn't want a parcel of great products shipped to their door every month? But in practice, you often find yourself falling in and out of love with them, as some months are really great and others can get quite repetitive, or you just receive products you don't like. Having gone back and forth with Glossybox and Birchbox - the two best known monthly beauty sub boxes - I was ready for something a little bit different. Step forward, Latest In Beauty. This service has been on my radar for a while. It has a slightly different approach, as you select the products that you want to receive. I decided to give it a try, and I've ordered my first standard box - more about that coming soon! But they also do curated 'collection' boxes and this 'Cosmopolitan Party Starter Kit' really caught my eye. You can see what products are included before you order, similar to Tili box. At £25 its a bit dearer, but the value of the items you receive (around £121) is definitely worth it. You get 15 items from some great brands. I knew I would use everything in the box, so I felt it was well worth the price. Back when Sleek launched, I had an absolute love affair with their eyeshadow palettes, which are beautifully pigmented. They really led the charge in the wave of high-quality drugstore brands that have emerged over the last few years, and I remember being astounded by how good the shadows were. I collected quite a few of them, but I must admit they'd sort of dropped off my radar for a while until I got this. The colours are a beautiful selection of warm metallics and all really wearable - you'll get a lot of use from this. Everything from a subtle daytime look to a full-on dose of glamour for the evening is in here. The colours are very dense and creamy and it's easy to get a strong look with them. This has reminded me how much I love their shadows and inspired me to dig out some of my other neglected Sleek palettes. It was my resolution to get a bit more sparkly with my festive season makeup, so I'm hoping these pots will tempt me to be brave. There are three styles in the box to choose from, and you can use them anywhere - face, body, nails. However you like! There are a chunky gold, a finely milled silver and a multi-coloured one with a mix of larger and smaller sparkles. The best part is, these are all biodegradable, so no damage to the environment. There's definitely something about a bit of sparkle that makes you feel ready to party. Glamglow must be one of the most buzzed-about brands out there, and I've been dying to try something from them for ages, so I was so pleased to see them in the box. The products are quite expensive, so this was the ideal chance to try something out before purchasing a full size - and this is the one I would have chosen out of the GlamGlow range, so it really sold the box to me. Gravity Mud is a peel-off mask that lifts and firms skin for a youthful, contoured look and a radiant finish. When you put it on, the mask changes from a white cream to an iridescent chrome colour so it feels quite magic and fun to use. I love to pamper myself with a mask if I'm travelling so this is ideal to take away. One thing I can't party without is smooth, de-fuzzed pins and the Venus Snap is perfect for on the go, because its really compact and comes in a handy little case so it's easy to travel with. Whether you need a razor to take on holiday, to the gym or just a quick emergency hair removal session in the work loos before going out, its ideal. I bought one when they first launched and that has been well-loved, so it was about time for a replacement. I love that although it has a compact handle, the razor takes regular Venus blades, so they can be easily replaced. It also has the moisture strips in-built, so you don't need to carry a shave gel either. As a total lash addict, I wouldn't consider going out if my flutter game wasn't up to scratch. Lashes instantly make me feel prettier, and Eylure is already one of my favourite brands as they fit my eyes well. They have a huge range of styles, but these Volume 100s are a classic - impactful enough to glam up your look, but not so scary and thick that you'll look like a Geordie Shore cast member. They add just the right amount of extra oomph and length, and they're a style I often choose for nights out. It's nice that they've gone for a classic popular style and not something really out there like i find beauty boxes often do. Another Sleek favourite, the Lip Creams are just as high quality as the eyeshadow offering. I've used these in the past and they've always gone on really smoothly and have worn really lightly on the lips, while still delivering a strong colour. What I like best about them is that they don't crack or flake off, like a lot of matte lip products. 'Rioja Red' is the perfect colour for the festive season - a bold, true classic red shade that will suit most people. This is a travel-size product, but that makes it great to pop in a clutch bag. These are a chuck-on-and-forget product because the staying power is so good, and with such a strong colour its really useful to have the doe-foot applicator as it makes it easier to get a defined outline. This is another brand I've been wanting to try for ages and asd you receive the full size brow pencil, which should be £19.00, its incredible value. This brow pencil has been developed with plastic surgeons and has won tonnes of beauty awards. It contains a whole load of ingredients to condition and stimulate brow growth, so its a treatment as well as a cosmetic - biotin (which you find in hair-regrowth treatments), green tea, grape seed oil, vitamins and antioxidants. One end is a spoolie to brush through brows and groom and then the other is a rich, creamy pencil that makes it easy to define and fill in your arches. My favourite nail polish brand is also included in the box, with this beautiful shimmery subtle rose gold shade that is very wearable. I do love a metallic mani! The formulation also cares for your nails with a sweet almond oil base and Matcha tea powder that's a potent antioxidant. It provides a moisturising boost to keep nails healthy and it's such a pretty, unique shade that I really like. A strong-hold hairspray is an ideal finishing touch to keep party hair in place. This formula provides fix without the crispiness and dries pretty instantly to hold your style and lock other hair products in, I also like to tip m hair upside down, blast hairspray into the roots and massage it in with fingertips for an instant volumised look, so this is another really useful handbag essential for a night out. The treats keep on coming! A blending sponge is definitely my preferred application method for foundation or concealer as you're guaranteed that flawless, Insta-perfect look. You can use this for anything, from applying your base to contouring and highlighting, and it has one chiselled side that allows you to get right into all the curves of your face. You can use it wet if you want a dewier finish, or dry for fuller coverage. I like to mist it with a setting spray and then use it to tap, press and roll the makeup on. If you're after an airbrush effect, this is the tool you need in your kit. What I liked about the Party Starter Kit was the mix of great, well known-brand with a few cult favourites I hadn't tried. Erborian is a Korean skincare super-brand that is becoming slowly more well known in the West for its high-performance formulas. This is is a perfecting primer that can be worn alone or under your foundation to give radiance to the skin. It gives a slight soft-focus effect that minimises pores and fine lines, and leaves a gentle, pearly glow behind, while helping your make-up to go the distance and keeping skin hydrated. All the reviews I can find for this are really positive, and I do love a good primer, so I'm looking forward to trying this out properly. Of course, you'll need to jump in the shower and get clean before that big party, so the kit also includes a little something for that. These washes are unique because instead of skin-stripping chemicals, the foaming agents are all natural botanical extracts, so you can get that beautiful later that makes you feel clean without the nasties. Packed with shea butter, this leaves skin silky smooth and I adore vanilla as a shower scent - it's so comforting, and complements most other fragrances you might be layering on top. Soaper Duper is a new brand from Marcia Kilgore (the creator of Bliss and Soap & Glory) so it's a safe bet that this will be pretty gorgeous. A travel size toothpaste is always a good thing to have, and this formula is a Charcoal toothpaste. I've recently begun using a charcoal toothpaste everyday, and I've been really impressed by the instant whitening boost it gives me each day - much more so than other whitening toothpastes I've used. This has Hydrated Silica and Activated Charcoal to really amp up your smile, so it's the perfect thing pre-party. It doesn't damage your tooth enamel but does a great job of brightening your smile and neutralising bad breath as its antibacterial.I've been really impressed with the one I'm using, so it's great to have a travel size to take away with me. Another genius pick, because again this is definitely something I'd want before a party or an event. I'm very shy when it comes to fake tan but this is ideal as it just adds a subtle hint of bronze and a low-key hit of shimmer that just makes skin look perfected and gives the illusion of longer, more sculpted limbs. Best of all, it washes off with soap and water, so you can't really have a disaster with it. You can use the product on its own or layer it over fake tan. I'll only use those gradual tan body lotions, so this is the ideal add-on. At the moment, I use Nuxe Huile Prodigieuse Or to get my glow on, but it doesn't really set like this so it rubs off easily on clothes. I think this will be better and it's getting rave reviews online for adding a really subtle perfected look to limbs and collarbones that photographs beautifully. At the end of your big night out, you'll need to take off the warpaint before bed, and on those occasions, facial cleansing wipes are really useful. Although I mostly use a cleanser, I always keep some face wipes for those days when I just don't have the energy for a two-step cleanse, and they're also great for travelling with. Although I haven't got especially sensitive skin, some wipes seem to irritate it, so I like that these are formulated to be gentle and infused with cottonseed oils to condition. I like that the packaging has a proper plastic lid, as it stops the wipes drying out. The cloth of the wipes is super-soft and partly made from cotton t-shirt manufacturing scraps, so they're eco-friendly too and with 99% natural ingredients and no silicone. 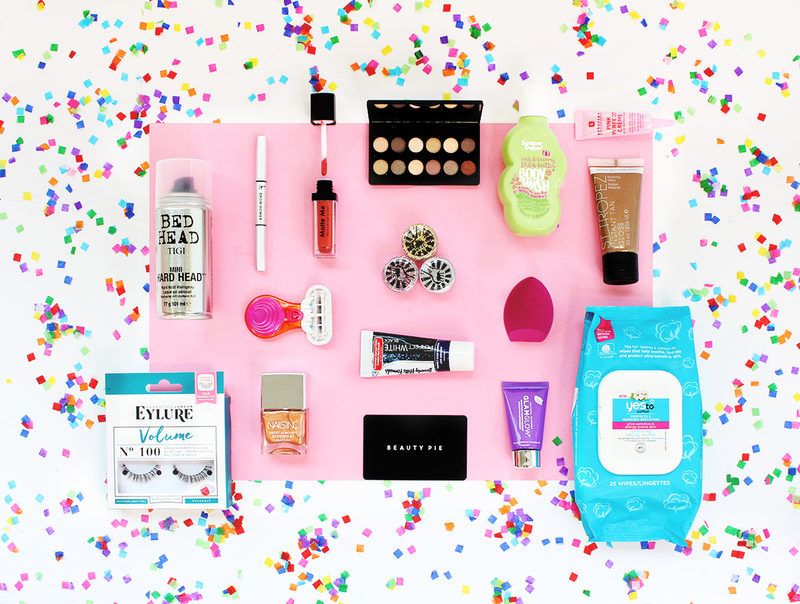 A bonus item is the inclusion of a 24hr pass to access Beauty Pie, a subscription makeup and skincare brand that's a big hit with me. As I'm already a subscriber, I can't make use of this, but it would be great if you're unsure if BP is worth joining. The foundations and skincare have really impressed me, so it could be a great chance to try those out - the member prices for products are under a fiver, so the whole premise is luxury without the price tag. If you want to subscribe, there's a £10 monthly charge (whether you place an order or not) so it's one of those things where you have to be sure its worth it! 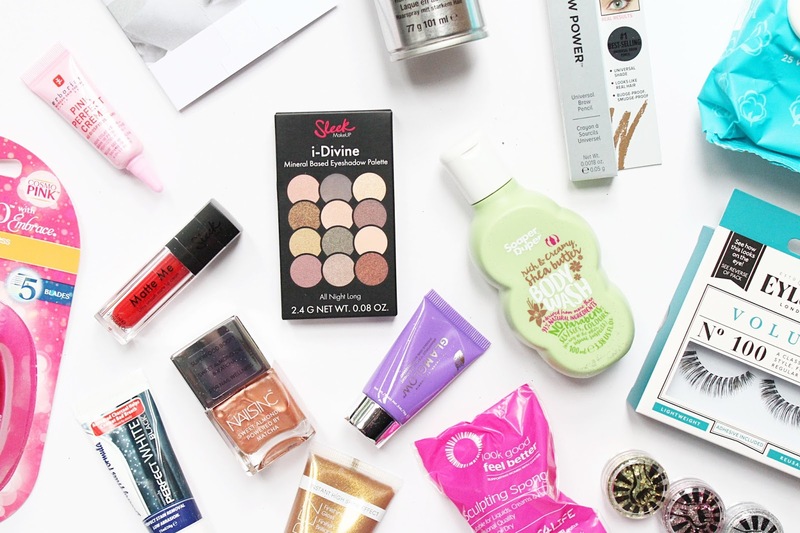 This box is such a great selection of products and great value. I loved that it mixed some tried and tested favourites of mine with a few new things. Everything is great quality and the box is ideally curated - it really is all the essentials for a big night out.After a few months of feeling 'meh' about the beauty boxes, this has got me excited again! You can still purchase this on latestinbeauty.com and use the code 'TREATYOURSELF' for 10% off as well.